How much does it cost to travel to Graz? How much money will you need in Graz? €89 ($100) is the average daily price for traveling in Graz. The average price of food for one day is €26 ($29). The average price of a hotel for a couple is €107 ($121). Additional pricing is in the table below. These average travel prices have been collected from other travelers to help you plan your own travel budget. Graz is the second largest city in Austria and the capital of Styria. The city has at least six different universities, and a large portion of the city's population is actually made up of students. Many of the main attractions in Graz are found in the city's old town, which has been declared a UNESCO World Heritage Site. There are also several sights elsewhere in town and even in the surrounding area. Popular places to visit include the Cathedral of Graz, the Burg, which is a castle built in the 1400s with an impressive double spiral staircase, Eggenberg Castle, the clock tower, the Joanneum Museum of Styria, and the Opera House. There are some beautiful churches spread throughout the city. The oldest one is the Leechkirche and the highest one is the Herz-Jesu-Kirche. It was designed by the architect Georg Hauberrisser in a Gothic Revival style. There are some Baroque churches on the other side of the Mur River. Shopping is a fun activity in Graz as well and one popular purchase is the unique pumpkin seed oil the area is famous for. The best place to purchase this is at the Kaiser-Josef-Platz market or any other farmers market. Some other great markets around town include the shopping street of Herrengasse, Steirerhof, and the City Park Shopping Mall. Graz is divided into 17 districts. 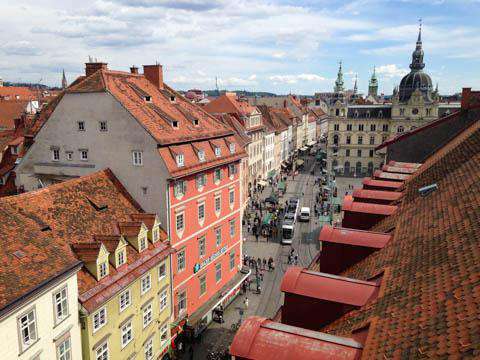 Innere Stadt is the old town and has been declared a UNESCO World Heritage Site. Other districts of interest include St. Leonhard, Geidorf (where you'll find the University of Graz), Lend, Gries, and Jakomini. The city's large student population means it has a very lively nightlife. Many of the area's bars are centered around the old town as well as the Karl-Franzens-University area. In the university area you'll find most of the bars frequented by students, but in the old town area there is more diversity. Both areas are appealing for their own reasons. Other activities around town include climbing up the SchloBberg and enjoying a meal in the fresh air at the top, visiting the ruins of the Gosting castle, or taking a boat on the Hilmteich or Thalersee. Plenty of other activities can be found, too, even if you only have 24 hours in Graz. There are many great restaurants around town for all budgets. You'll easily get the best deal at lunch when there are usually specials available such as the dish of the day, referred to as "Tagesempfehlung". Other cheap options around town include places that sell kebabs or various street stalls. There are some good kebab places on Jakominiplatz, Dietrichsteinplatz, and Hauptplatz. There's also a supermarket in the Hauptbahnhof where you can pick up some food for cheap. This is the only grocery store open on Sunday. You can generally wander around the city's old town on foot. The old town is also about a twenty minute walk from the main train station. You can pick up a map or any other information you need at the information center in the train station upon arrival. Most hotels also have plenty of information and brochures available as well. If you're going a further distance or don't feel like walking, your other options include buses, trams, or taxis. The tram service is quite good. Tickets are available on an hourly, daily, weekly or monthly basis. Where trams do not run, buses provide a good alternative. Buses generally go through Jakominiplatz, Hauptbahnhof. Tram and bus tickets are interchangable. Taxis are relatively easy to find and you can wave one down from the street. It's also possible to call ahead. It's best not to take a taxi during rush hour, as the traffic congestion will make the rates outrageously expensive. Biking is very common in Graz and the city has a great network of bike paths. It's possible to rent a bike or you might even consider buying one used if you're going to be in town for a while. Make sure you watch out for trams and traffic and pick up a map of the routes before you head out. Visit Graz in the summer and you can join the locals in visiting the AIMS Recital and Concert Series. Every year this program, one of the best of its kind, brings together opera singers and concert performers for a wonderful festival and series of concerts. The events take place throughout the city in castles, churches, courtyards, and of course concert halls. A the end of the series there is the famous Meistersinger Vocal Competition, complete with a full orchestra. If you can be in town for these events, it's definitely not to be missed.